The other day we discussed the best bowl sizes and materials for CH cats. But any CH cat parent will tell you that it doesn’t end there. 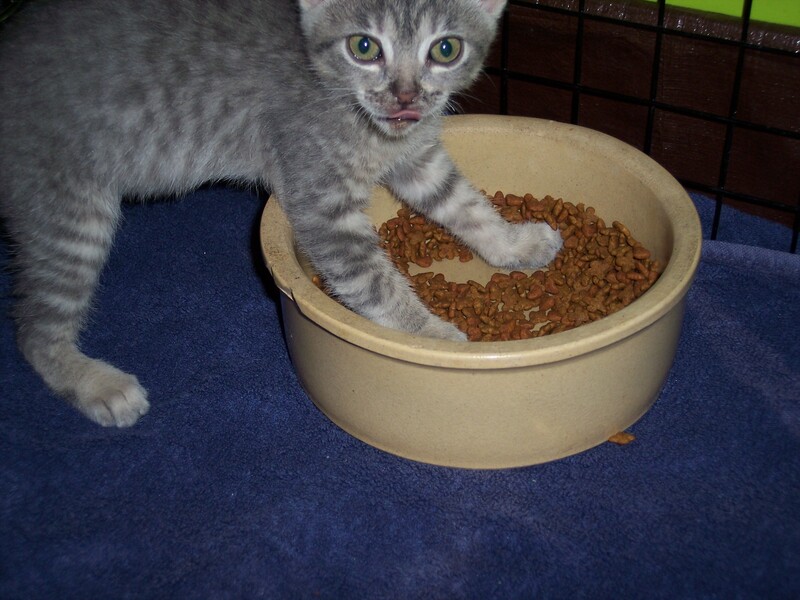 Mealtime with CH cats can be a messy experience that requires a good amount of space! Here are some more tips and tricks to help your cat (and his bowls!) stay in place during mealtime. Do you think your cat would do better with raised bowls or bowls on the floor? Most CH cats do just fine with their bowls on the floor. In fact, some may prefer it since they may lie down while eating. Others tend to scoop kibble out of the bowl on to the floor where they’ll eat it. If that’s the case, you may want to purchase a shallow bowl, so it’s easier for them to scoop it out. You also will want to keep this eating area particularly clean after every meal, as food can get licked and stuck onto the floor — not to mention you don’t want your cat to consume a dust ball by mistake! If your CH cat is unsteady to the point where leaning down to the floor to eat or drink is a problem, consider raising his bowls. This may not be the ultimate solution, but it will help steady your cat by cutting back on the rocking motion of bending down to eat then coming back up. There are several feeding stalls out there that may work for your CH, but you could certainly design your own feeding stall if you’re handy. Either way, you’ll want to make sure that the bowls and their platform are sturdy. You never know when your cat may tumble into it! 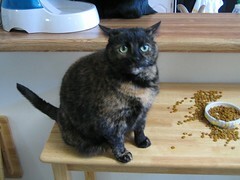 If you’re not sure which method would work best, watch your cat during mealtime. It may help you determine which way to go. And if you have kittens, you may want to take a look at this great feeding stall idea. Does your cat push around his bowls? Mealtime can be an exciting time for any cat, which can result in an over-eager eater pushing his food bowls or plates all around the floor! To cut back on this, place cut out a circle of anti-slip material and glue it to the bottom of the bowl or simply add a few dabs of glue from your hot glue gun to the bottom and let them cool. Another option is to place a silicon mat below the dishes. Mats can be helpful because they’ll contain (most) spills. If you don’t think a bowl’s a good idea for your CH cat, that’s fine too. Some folks use only a mat during meal time. They’ll take a handful of kibble and put it on the mat, so their cat doesn’t need to worry about the bowl at all. Again, at the end of the day, these decisions completely depend on your cat’s abilities and needs. If you think your cat is doing just fine with his current set-up, that’s great! However, if you think your cat could use a little help, it may be worth it to check into making a few changes. Do you have any tips? Please share in the comments! Click here to find more tips! I probably mentioned it before, but Chairman’s bowl/water fountain are on a big cookie tray. catches *most* of the mess.